The Glocal Torbole is born from the will to create a place with a “global” atmosphere, which however encloses a lively “local” soul. The global is yours, with unique needs, expectations and stories that here at Glocal interweave in a wonderful setting such as Lake Garda, specifically the Garda Trentino, a true outdoor gym where: windsurf, kitsurf , sailing, mountain biking, climbing, trekking, or simply relaxing, become unforgettable experiences for beginners and professionals. Here at Glocal Torbole we want to define ourselves as “artisans of hospitality” because we consider welcoming a true art, to follow and develop in particular through a direct relationship with YOU. We do not have automatic responses or standardized offers, we have unique and special responses, in the belief that Glocal Torbole can become part of a “tailor made” vacation. Behind the scenes of Glocal Torbole we are: Michele, Emanuela, Adele Sole and Amy. First of all we are a family: Michele 42 years old artisan printer, Emanuela 37 years old hotel manager, Adele Sole 12 year old student with the dream of becoming a doctor and Amy 9 year old lover of running and space travel. Through the experience of unforgettable trips to discover the unique and special beauty that is contained in the travel itself, we open the doors of our Glocal Torbole. With our idea of ​​hospitality, made of spontaneity, genuineness and pleasantness. Trekking, windsurfing, kitesurfing, sailing, mountain biking and climbing will fill your holiday with healthy adrenaline. Beaches, spas, museums and amusement parks will satisfy everyone’s wishes. The Glocal Torbole is a place to enjoy your days in pleasant freedom. By sharing some spaces like the kitchen, the living room and the veranda we hope to create a stimulating environment for everyone. A breakfast made in collaboration with a master pastry chef to create a rich buffet that spouses different types of food. A sweet and savory variety will let you great start your day at Glocal. The global and the local can be seen as the two sides of the same coin. Freedom rooms are located on the ground floor and respect the canons of an accessible tourism, ample space of movement respecting 100% all the needs of stability and security. Here at Glocal we like all the definitions of family, to whom we offer a solution of two communicating bedrooms, with two bathrooms and a large shared terrace. The Bella room are unique pieces, through the art of Italian design. The interior spaces and the balcony offer a pleasant feeling of spaciousness, to be lived day by day. 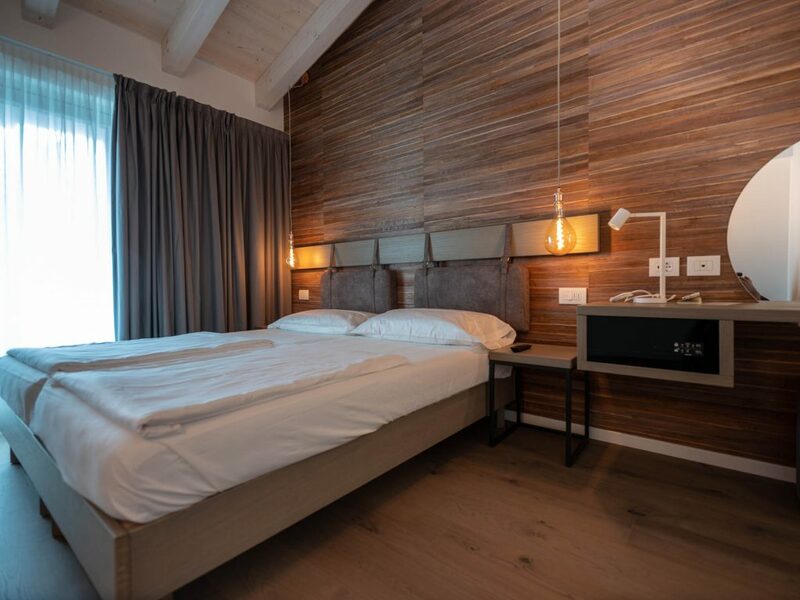 Traveling for some means sharing every space, which is why here at Glocal Torbole it is possible, at certain times, to rent only one bed in a room shared by two or three people. Questions? We are always ready to answer you!